One hundred and one readers love this post. Say WHAT!? Oh, yes. 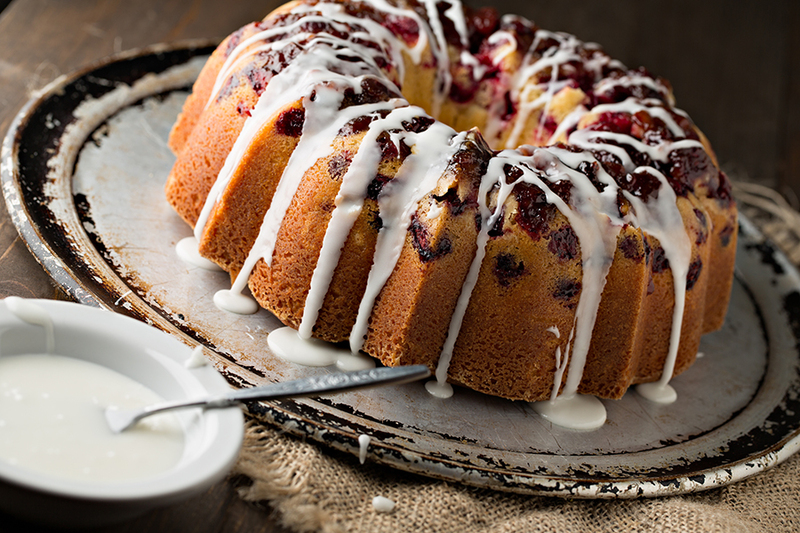 Fresh cranberries and clementine zest give this cake an excellent flavor, and we push it right over the edge with a boozy glaze. Cream together butter and sugar until combined. Add eggs, 1 at a time, mixing until incorporated. Add clementine zest, clementine juice, and sour cream; mix until incorporated. Add flour, salt, baking powder; mix until combined. Add 1-1/4 cup cranberries and stir. Grease a Bundt pan and evenly sprinkle with 2 Tbsp. sugar. Pour 1/4 cup cranberries into the pan. Pour batter into prepared pan and bake for 50-55 minutes or until pick inserted in center comes out clean.Let cake sit in pan for 5 minutes after removing from oven, then turn cake over on a wire rack to cool. While cake cools, prepare glaze by mixing powdered sugar with the liqueur, whisking to combine. Pour glaze over completely cooled cake. *It can be difficult to find fresh cranberries after the holidays; you can substitute other fresh seasonal berries.